In round 4 the dark roasted malts were center stage. 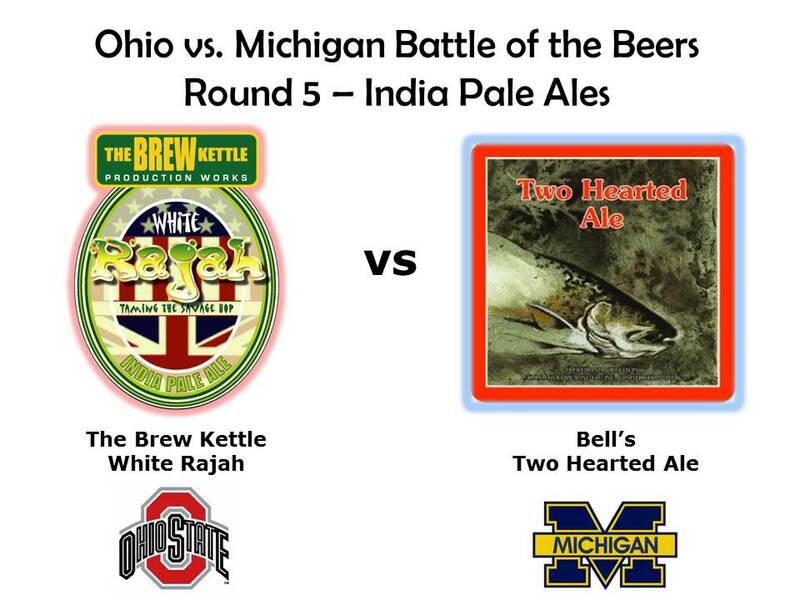 In round 5 we go to the opposite extreme with two beers where the juicy American hops dominate, completely overshadowing the malts: The Brew Kettle’s White Rajah vs. Bell’s Two Hearted Ale. White Rajah by The Brew Kettle (Strongsville, OH) – The Brew Kettle is a medium sized brewery located in Strongsville, which is a suburb of Cleveland. You can get quite a few Brew Kettle beers in Columbus, but among those that I’ve tried one stands above the rest, White Rajah. The description on the label sums this beer up pretty well “A West Coast style IPA full of citrus-like and tropical fruit-like hop flavor and aroma with an assertive yet smooth bitter finish …. malt, take a back seat please”. If you scroll down in the taste test section of this site you can find the IPA challenge we had back in October, where White Rajah beat out nine other beers to win the title of the best IPA in the world (that you can buy in Columbus). That’s why I chose this beer to represent Ohio over other renowned Ohio-brewed IPAs like Headhunter IPA and Columbus IPA. White Rajah clocks in at 6.8% abv and 70 IBUs. Two Hearted Ale by Bell’s (Kalamazoo, MI) – This is our second and last Michigan entry from Bell’s, the largest brewery in Michigan and 7th largest in the US. I suspect most readers of this site will need no introduction to this beer. Two Hearted Ale is an iconic American IPA, and long-time go to beer among Midwest hopheads. Somewhat unusually only one variety of hops, Centennial, is used in Two Hearted Ale. The aroma and taste of this beer are a testament to the versatility of the Centennial hop. I find there are variations from batch to batch in the quality of Two Hearted Ale, but this beer was exceedingly fresh (only bottled two weeks ago) and representative of Two Hearted Ale at its best. It tips the scales at 7.0% abv and 55 IBUs. White Rajah is a hazy, translucent beer that has a color I liken to liquid gold. It pours with about 1 finger of white head. Although the amount of head is pretty modest, if you swirl the beer around the glass it leaves behind a persistent white lacing on the walls of the glass. The smell is hoptastic, over the top tropical citrus fruits, its aroma is as fruity as any IPA I’ve encountered. Finally coming to the taste, the citrus fruits are still front and center, but they give way to a slightly piney, lingering bitterness on the finish. This beer is a showcase for the hops, with no pretense of balancing them with the malts. The mouthfeel is kind of sticky as you tend to get with IPAs, although interestingly as it warms the mouthfeel actually gets quite creamy. The Two Hearted Ale pours a clear golden amber color with 2 fingers creamy white head. As with the White Rajah, citrus fruits are also prominent in the nose, but not quite to the same extent. The hops impart a nice fruity (oranges, grapefruits) taste on top of a slightly sweet malt base. It’s a nicely balanced beer, for an IPA, with enough bitterness to keep the finish dry, but not so much bitterness to cause face contortions. It’s a classic example of the West Coast IPA style. Both beers lean heavily toward the tropical/citrus fruit hop profile, as opposed to the piney, resinous character that you get with some IPAs. Neither is excessively bitter, so if you like you’re IPAs fruity and flavorful with restrained bitterness you would be in good hands with both beers. I’m drinking a Two Hearted Ale as I write this review and my brain is telling me this is a delicious beer. I’ve been a little disappointed the last few times I’ve tried Two Hearted, but this batch has restored my faith. However, White Rajah takes the IPA style to another level. Comparing the two is like comparing 1963 Bob Dylan (Two Hearted) to 1966 Bob Dylan (White Rajah), the Yardbirds (Two Hearted) to Led Zepplin (White Rajah), or the Dubliners (Two Hearted) to the Pogues (White Rajah). Some people prefer the classic and find the amped up version less appealing, and I can respect that opinion. If that’s you I would point you to the Two Hearted Ale, but I’ll take the supercharged version, so my vote goes to the White Rajah. On a 1-10 scale I give Two Hearted Ale a 7.5 and White Rajah a 9.